The sleek and stylish appearance of stainless steel appliances could really add a great look inside our homes.Some of the most common among stainless steel appliances are your microwave ovens, cooker hobs, and even coffee makers. The overall appearance of stainless steel finished appliances isn’t just about the beauty. It also says something about the durability and antibacterial capability of this stainless steel coating. Though known to be durable and flawless, it doesn’t mean that it is totally free from rusting and other damages. Stainless steel appliances come with a protective layer coating. This protects the appliances from damages and stains. The usual wear and tear condition of stainless steel appliances require proper cleaning and maintenance. Homeowners need not worry, as having these beautiful and shiny appliances maintained is not a stressful job at all. Check out our top tips on how to clean your stainless steel appliances. Stainless steel appliances require a specific cleaning material for specific stains and damages. For limescale deposits, a diluted vinegar solution with the aid of a soft cloth will surely remove it. This is applicable for cooking and liquid heating appliances like air pots, kettles and coffee makers. For adhesive tapes residue, a mild nail polish remover with the aid of a soft cotton will do the job on removing it. This is very common along large stainless appliances like the refrigerators, microwaves and even washing machines. 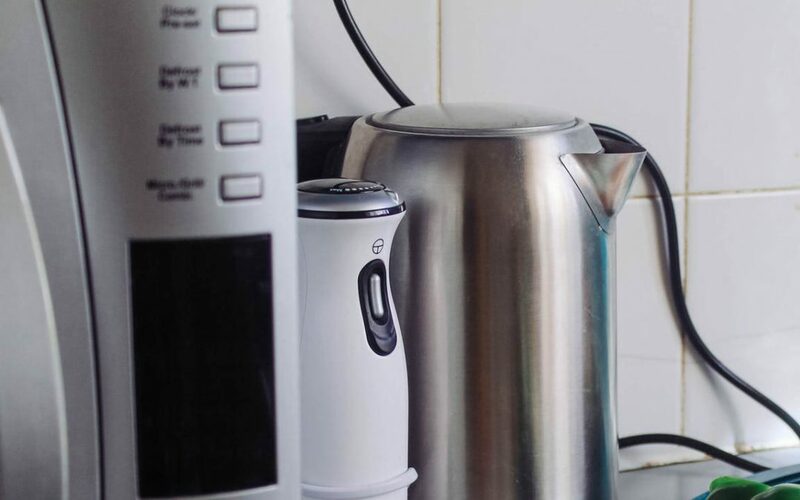 For caffeine deposits from tea and coffee, you need to sprinkle a dash of baking soda on the affected portion of the appliance. Leave it for around 2 hours to let the deposit be absorbed and simply wipe it away with a tissue. This is a common problem for coffee makers, and stainless air pots and kettles. Always remember that soft cloth, paper, and cotton is always advisable as a wiping agent. These materials won’t be scratching the grain of your stainless steel appliances. Just like expensive leather, stainless appliances has its grain. It is the pattern on how the lines of the alloy are arranged. Wiping your appliances following the pattern will take it away from further damages and scratches. The grains are arranged in a very specific pattern to add more beauty and shine. Going against it will be adding more strains, and will just result in unusual patterns, which will eventually look like scratches. Refrigerator is one of the common appliances with visible grains. Make it a habit to clean it going with the grains. Stainless steel might be a durable metal, but it is still easily corroded. Agents like chlorine or chloride are one of the leading corroding agents. You can find chloride in bleaches and jewelry polishing solutions which is mistakenly used by homeowners in cleaning their stainless steel appliances. On the other hand, usage of metallic wipes like steel wool and abrasive pads is also a cleaning no-no. These materials are harsh when scraped against a metal. Instead of cleaning, they will just add some more scratches to the appliances. Polishing stainless steel appliances like refrigerators, cooker hobs, dishwashers, and freezers could also help in maintaining them. An appliance maintenance expert is advisable to do this job for you. But if you think that you can do the polishing, then you can also surely do it by yourself. A quick trick is to use a chloride-free toothpaste to shine the stainless appliance. You need to buff it using a soft bristle brush, and your appliance will be looking good as new. But take note that it is just a short-term remedy. An expert’s help is still advised. Last on the list is to keep away your stainless appliances from liquids. Leaving some liquids like water, and other solution could lead to deep marks and staining. So after every use, it is advisable to wipe them clean. Appliances like cooker hobs, kettles, and air pots are the usual victim of liquid splashes. If these appliances are left with water, and other substances, rusting might also be present. Which is a tougher battle to handle when it comes to maintaining appliances. A quick DIY hack to make these stainless steel appliances waterproof is by splashing few drops of olive oil into them and wiping them dry with a soft cloth. It does not only make it waterproof, but it also serves as a polishing agent.